Join Bryan by helping with immediate disaster relief for Haiti. Text BRYAN to 90999 to give $10 to Compassion International and Help Haiti. Bryan White and his wife, actress Erika Page, are doing an admirable job balancing two careers and two young sons, Justin and Jackson. Bryan is now on a long radio tour promoting his new album, 'Dustbowl Dreams,' while Erika has been focusing on her family since leaving the daytime soap 'One Life to Live' ... although she worked briefly on 'Days of Our Lives' last year and plans to film a drama entitled 'The Singing River' this year. Given her line of work, which sometimes requires doing steamy love scenes, it wouldn't be surprising if Bryan received a visit from the green-eyed-monster from time to time, but the singer says that's not the case. "No, I don't get jealous," Bryan tells The Boot. "I don't see any reason for me to watch [those love scenes] so I don't choose to watch it. When I get to a point like that, I kind of know it's coming, I'll flip to another channel. One time we were working on vocals, and we took a break and turned on TV, and there was my wife in a steamy love scene, and we all looked at each other and went, 'Wow!' and just turned it back off. We said, 'Maybe we should just get back to work.'" Bryan and Erika, who will celebrate 10 years of marriage in October, make an effort to keep their love alive without taking each other for granted. "We try to shake things up and keep surprising each other," Bryan explains. "Life can become mundane and just feeling like you're going through the motions sometimes. For one, with our kids, there's never a dull moment. But, we have to take time to go do fun things for us. So we make a strong point to get a babysitter." For Bryan and Erika, a night out doesn't have to be glamorous. Sometimes simple fun is best. "We take time to do something fun together -- which is just going out and grabbing a bite to eat. We're nerds too. Sometimes we'll go to Borders with a cup of coffee, and we'll just grab a pile of magazines and sit in a corner. I think that's the important thing -- shaking it up and making sure you're spending quality time with each other. Because sometimes you can feel like you're just passing each other in the hallway doing all the stuff we've got to do. You've got to stop and look up." Bryan's latest album, 'Dustbowl Dreams,' is in stores now. 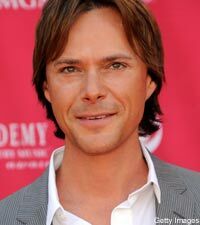 Bryan White, who has co-written hit songs for the likes of Diamond Rio ('Imagine That') and Sawyer Brown ('I Don't Believe in Goodbye'), has also charted 17 singles himself, including six No. 1's such as 'Someone Else's Star' and 'Rebecca Lynn.' The Boot caught up with Bryan at his home in Nashville to find out where he was when he heard his first record on the radio. This would have been, I'm guessing, '95 ... and I was maybe all of 20 [years old] at the time. I was on an independent label, and we were on a real extensive radio tour on the west coast. We were on our way to Tucson to visit a radio station. On the way, I heard my single, which was a song called 'Eugene, You Genius.' It was an uptempo, fun kind of thing -- a tongue-in-cheek kind of song. I heard it on the radio, and I freaked out so much so that I made the label rep find a convenience store to pull over because we didn't have cell phones then. We pulled over, and I got the number from my rep and went in and called the station from the pay phone, and they put me on the air. I was so jazzed, because that was literally the first time I had heard my voice on the airwaves. I thanked them and just told them how much I appreciated that. I made sure that they knew that was the literally the first time I heard myself just driving down the road! I wish I still had a copy of that audio of me calling in. That would be so special to have. I can visually see it. I can still see where I'm at, what the gas station looked like, and the rep who was with me was smiling. 2009 offered up a treasure trove of high quality country music, and we’ve compiled a list of the year’s 50 best country songs. In order to a be considered for this list, a song must have appeared on an album released during the 2009 calendar year. Radio singles that appeared on 2008 albums but which were primarily promoted to radio in 2009 remained eligible so long as they did not appear on the previous year’s list. "Over the river and through the woods, to grandmother's house we go ..."
What could be better for a child than spending Christmas at grandma's house and the North Pole at the same time? Impossible you say? Not if your name is Bryan White. "Hopefully you won't think I'm weird when I tell you this," Brian explains to The Boot, recalling a favorite childhood Christmas memory. "My grandparents had this huge house shaped like a horseshoe. There was this snow white carpet that my grandmother had in the living room where the Christmas tree was. She had one of those old trees that had the fake snow on it, and the tree was white. You remember those ... (and under it) it's like this stain glass plastic circle thing with different color shades. It was like a little gel in front of a light, and it went in circles, and it projected a colorful image onto your tree. It made this squeaky sound from this wheel turning. "I remember one Christmas night I just felt this real warm, cozy feeling by the tree with that thing going. When everybody went to sleep, I would get up out of bed and go get under the tree with that little thing going, and I would just sleep under the tree. I know that's weird. But as a kid, I felt like I was at the North Pole. There was something neat about it. "You might want to Google what that little thing is called – the little light crank." Good news, Bryan. We did indeed look up the "stain glass plastic circle thing with different color shades" and here you go. It's called a Penetray Rotating Lighted Christmas Color Wheel. Sweet memories are made of this. Bryan White just finished writing a Christmas song -- 'Finding Christmas' -- inspired by his sons Justin, 6 and Jackson, 4. "The song is about becoming jaded as we get older and when we become adults, there's really no mystery any more," Bryan tells The Boot. "The element of surprise and mystery is gone and ... I'm finding it all again through their eyes. I feel like I am seeing it all again the second time around through them, and it's awesome. They've been really anticipating Christmas since October. As soon as Halloween was over, their Christmas questions were just being fired at me right after that." Bryan's own childhood recollections of Christmas serve as a blueprint for the memories he wants his children to have. "I remember when I was a kid [my parents] knew we were just bursting at the seams, so most of the time we got to open one gift on Christmas Eve just to kind of tide us over until the morning. We'll probably do that. We've had our tree up since Thanksgiving. That was a fun process, just getting the tree down and them helping us. They're old enough now that they want to have a purpose with everything, they want to be a part of it." And before the kids go off to bed on Christmas Eve, they'll have one more task to complete. "We'll write a note to Santa, and we get the cookies and milk and set that out," Bryan says. "Then the next morning, I'm up before them with the video camera. I got them last year really good coming down the stairs. They were still kind of half asleep, kind of wiping their eyes, but you could tell as soon as they walked in the living room and saw the gifts, they were just so excited. It was just awesome!" Bryan and his wife, actress Erika Page ('One Life to Live'), also feel it's important to bring the 'real' meaning of Christmas to the forefront. "I would say we probably spend more time devoted to Christ being born ... why we're celebrating, more than the Santa Claus. We sort of make sure they know -- we try to just let them know that Santa is just one of God's helpers." Bryan's been busy chasing Donner and Blitzen on his radio tour for the last few months, promoting his latest studio album 'Dustbowl Dreams.' He plans to record his new Christmas song in 2010.